Update: SEGA has kindly sent us some juicy assets (screenshots, pack shots, etc.) and a press release for the game – scroll down past the original post to see the gallery! Original post: SEGA Fes is turning out to be one hell of a show. For years, fans have been clamoring to get a modern release of Shenmue on current consoles and SEGA has heard our plea. During today’s SEGA Fes live stream, SEGA announced that Shenmue I & II would be heading to PlayStation 4, Xbox One, and PC. Based on the trailer, it appears to be a straight port with shined up graphics. Since their original release, Shenmue I & II have established a passionate following and are revered as one of gaming’s greatest series of all time. These revolutionary masterpieces deliver a gripping story of retribution as Ryo Hazuki sets out to avenge his father’s death and attempts to unravel the secrets behind a mysterious artefact known as the Dragon Mirror. Shenmue I & II comes complete with the original feature set that defined modern gaming, including enthralling jujitsu combat, investigative sleuthing, and RPG elements in addition to memorable mini- games. Shenmue I & II is set within engrossing real-time open worlds that feel truly alive thanks to day-to- night cycles and weather changes, with a population of civilians who follow their own schedules. This is the definitive version of these all-time classics and will be the best Shenmue experience to date. The re-release will stay true to the originals with modernised features including fully scalable screen resolution, choice of modern or classic control schemes, PC graphics options, an updated user interface and the option to enjoy either the original Japanese or English voiceovers. Shenmue I & II is scheduled to be released worldwide this year. It will be released as a physical and digital release. A LEGEND IS REBORN. SHENMUE I & II LAUNCHING FOR PLAYSTATION 4, XBOX ONE AND PC IN 2018. SEGA’s most requested re-release of all time finally comes to a new generation of gamers! London, England – April 14, 2018 – SEGA® Europe Ltd. is proud to announce that the pioneering epic saga Shenmue™ I & II is to be re-released for a new generation. Get ready to go on a thrilling voyage across faithful recreations of Japan and Hong Kong, China, in a timeless tale of revenge and mystery when Shenmue I & II launches both physically and digitally on PlayStation® 4 and Xbox® One with a PC release on Steam in 2018. 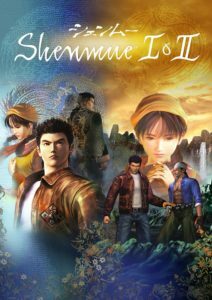 Shenmue I & II comes complete with the original feature set that defined modern gaming, including enthralling jujitsu combat, investigative sleuthing, and RPG elements in addition to memorable mini-games. Shenmue I & II is set within engrossing real-time open worlds that feel truly alive thanks to day-to-night cycles and weather changes, with a population of civilians who follow their own schedules. Live and learn everyday. Dreamcast and Shenmue are the epitome of gaming! Check out the SEGA Nerdcast with Shenmue’s English voice actors!